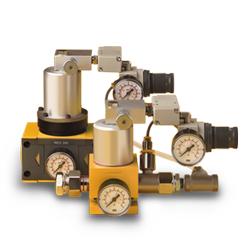 Reduce damage to diaphragms and other moving parts by eliminating shock load conditions with Versa-Matic’s Anti-Shock Valves. Operated manually or remotely, Anti-Shock Valves enable the pump to start smoothly and gradually, minimizing the risk of vibration damage on the pipe system and pipe fastening. The risk for cavitation during start-up is also significantly reduced.